There is general agreement that walking is good for your body and mind. Getting outdoors, exercising, talking, looking and learning, engaging with the landscape and moving around in an environmentally friendly way all sound like – and are – good things. And this is why themed walking trails are increasingly important and attractive. They allow a structured engagement with a particular place, facilitate route planning and way finding, and in some cases are accompanied by information in the form of leaflets, noticeboards, way markers, QR codes or apps. Archaeological sites and other heritage resources are ideal subjects for such guided walks or Heritage Trails because they are usually out of doors, frequently involve a bit of a walk to get to, and lend themselves very well to narratives of landscape change and deep time. In an urban prehistory context, Heritage Trails are often a very good response to developments which will either destroy or massively impact on archaeological sites due to urbanisation. In this post I want to look at two urban heritage trails, one that happened in the 1980s and has been something of a disappointment, the other currently being proposed which at the time of writing appears to be in danger of falling short of aspirations. These two trails – at Balfarg in Fife and Didcot in Oxfordshire – have very different origins. The former was a Council-led initiative, the latter has very much been driven by the local residents. The community approach is by far the most satisfactory, bottom-up as it were, and has the most potential to make an enduring and meaningful difference to the lives of communities in new urban places. Yet top-down interference seems to never be far away, and the ‘authorities’ and ‘experts’ (and within that I include archaeologists) don’t always know what works best or what local people want (never mind what they need). And when money is involved, strange decisions get made. Both Balfarg and Didcot also provide salient lessons for me in my attempts to think through what urban prehistory Heritage Trails could look like in emerging development situations. Almost 20 years in the making, the Balfarg Archaeological Trail was completed in 1991, and was conceived of with the best of intentions. It was the outcome of an emergent suburb of the New Town Glenrothes. Although this town was ‘created’ in 1948, it went through many decades of expansion, replicating outwards as suburbs, industrial estates and roundabouts. The development of this New Town was about providing ‘quality of life’ and key elements of this for the Glenrothes Development Agency were art, heritage and identifying a sense of community and place. (For instance, David Harding was employed as the town artist.) 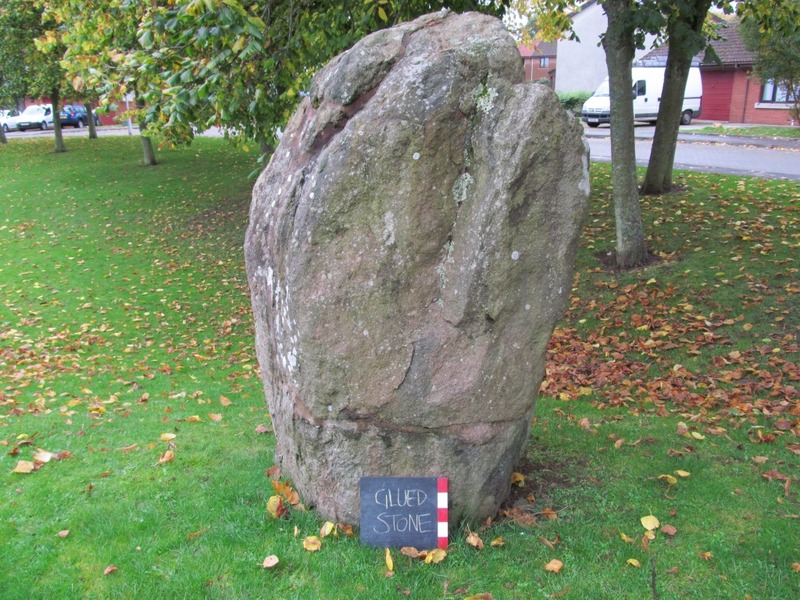 These concerns came to the fore with a series of fusions between prehistory and progress – a stone circle (Balbirnie) in the way of a road development, and two henges monuments at Balfarg located where housing development has been designated. The prehistory of Balfarg was peeled back and exposed in the name of development and the expansion of our modern infrastructure. The archaeology was not allowed to stand in the way of creeping urbanisation. And one consequence of this was a need to compensate society for the essentially unnecessary movement of megaliths and destructive excavation of ditches, postholes and burials. Amidst the expanding community, archaeologists trowelled the grey-brown soil, scraping away the past layer by layer, with an ambivalent and impatient community in waiting. 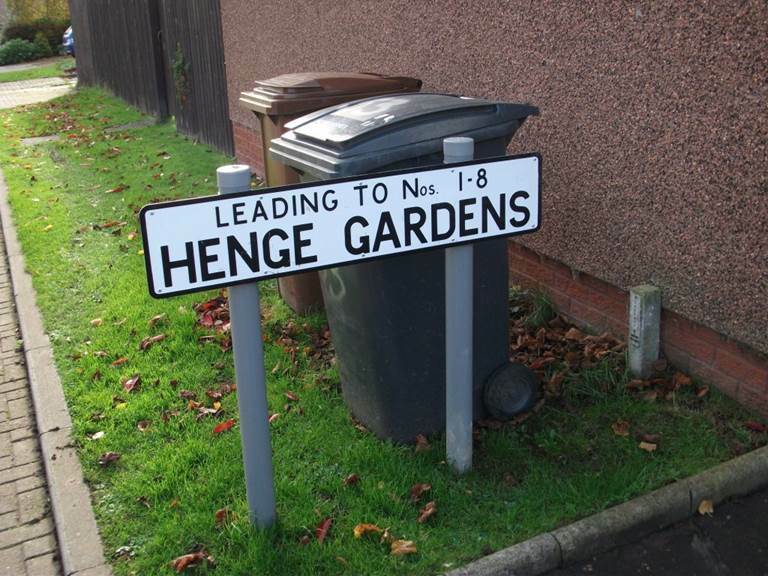 New houses were ready to be built on streets with exotic names: The Henge, Henge Gardens. 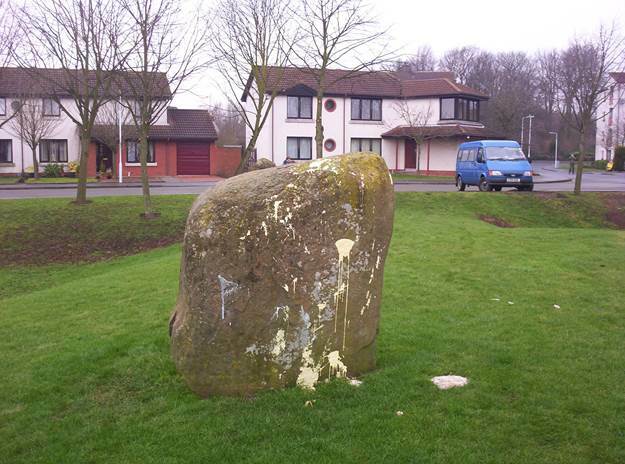 The stone circle was buffed up, a landscape garden feature. A reconstruction of a timber structure was put in place, a telegraph pole replica of the original, abstract art and place for dogs to relieve themselves as the traffic thunders by. I recently asked Gordon Barclay about his memories of the trail being set up and his time excavating at Balfarg Riding School in the 1980s. He recalls there being some but not much local interest during the excavations which happened in advance of a new housing development. Roger Mercer, who excavated Balfarg Henge in the late 1970s, told me of different forms of interest – a standing stone wrapped in straw for protection, set alight by locals, and shattered. It had to be glued back together, sticky with the apathy of the emergent community. Graham Ritchie, who excavated Balbirnie stone circle out of existence in the early 1970s, told me of his frustrations and of a new and inauthentic version of the site being created. He wrote years later: “Many excavations involve the ghastliness of destruction, the raising of unrealistic hopes of discovery and the re-creation of something rather different – Balbirnie had it all”. Three great excavators, three prehistorians, all working in an alien urban landscape and having to deal with people in the present (locals, politicians, planners, civil servants) more than Neolithic or Bronze Age people, whose dry remains were, at times, recovered by all three men. There followed the initiative to set up the Trail, very much championed by the then Fife Council archaeologist Pete Yeoman, and a ‘popular’ guidebook was also produced, largely written by Gordon Barclay. 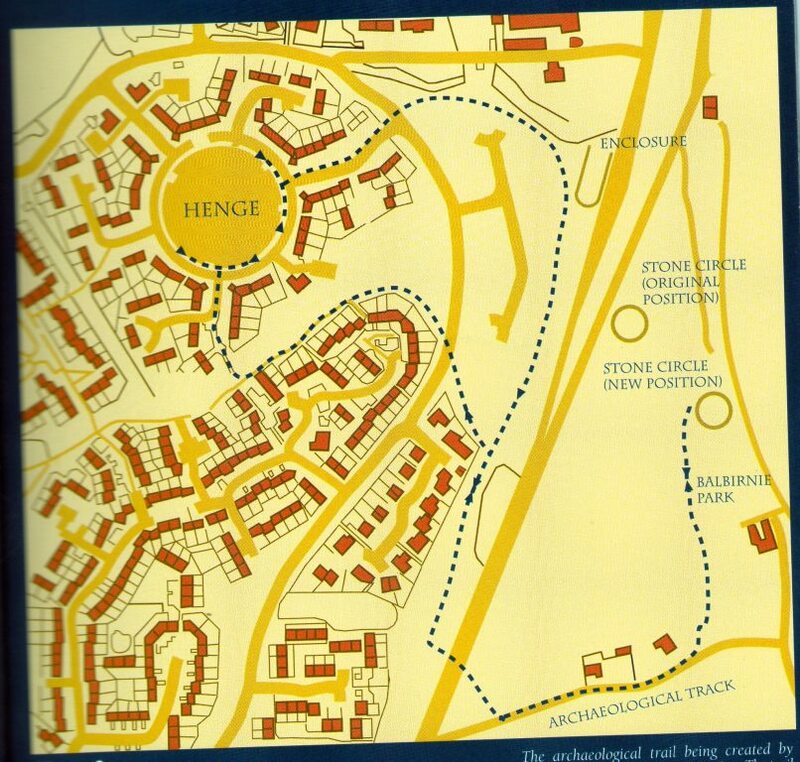 The booklet included a map of the trail, and thus acted as a guide for the walker / tourist / local resident wanting to follow the strangely named ‘archaeological track’. 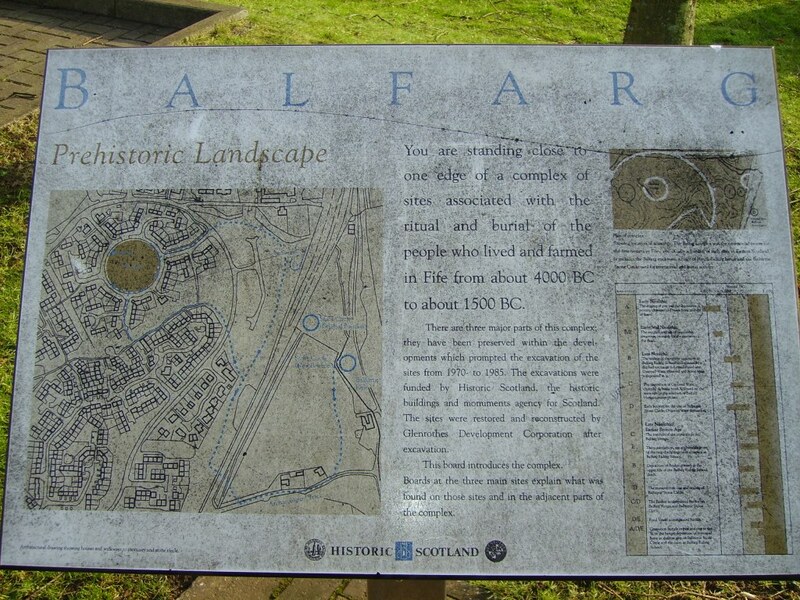 Noticeboards were erected at key points on the trail – one each at Balfarg Henge and the Balfarg Riding School (BRS) structure and two at the Balbirnie stone circle. Yet despite all of these efforts, as Gordon Barclay told me, the trail always seemed fragmented. In part this was because in order to get to Balbirnie stone circle, one had to negotiate a very busy A road with no pedestrian crossing. And there are other systemic problems with this trail. There are no signs (although the henge is signposted from the main road with a brown sign) and therefore no sense of how to use the trail even if one were to visit (which to be honest seems unlikely). And over the past decade the logic of the trail has fallen apart as new housing developments encroached on the southern trail to the extent that this path no longer meaningfully exists. (In reality the trail was never more than existing pavements, public footways and meanders across grass.) Getting from BRS to Balbirnie now involves a different but equally challenging road crossing, but this is a route that that is not in the booklet or on the signs. Local knowledge is required to navigate a proliferation of signage and urban furniture. Sadly the noticeboards have suffered since their erection through vandalism and lack of maintenance. 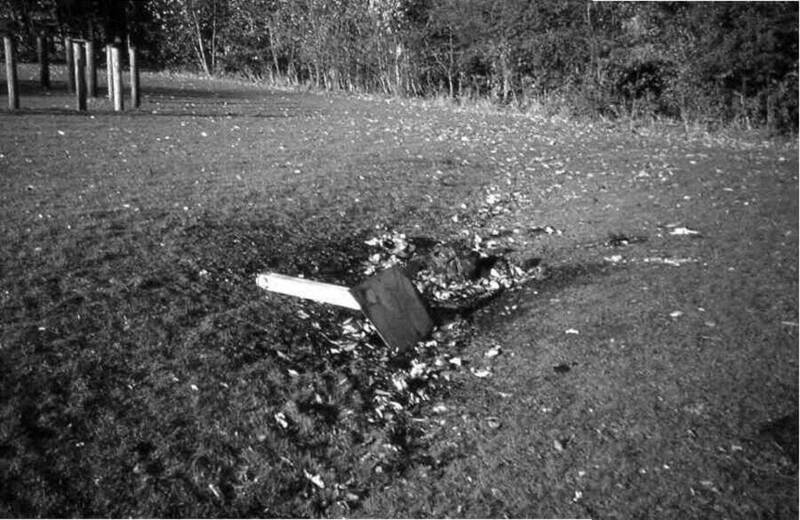 The noticeboard for the BRS site was uprooted and set on fire, then tossed into the henge ditch in the mid-1990s. The Balfarg henge noticeboard is impossibly dirty, and last time I visited in 2013, something plastic had been melted here, a circle of pinkish hard plastic having pooled at the base of the support. The pair of boards at Balbirnie are dirty to the point of illegibility. Graffiti has been evident from time to time. This is by no means the story of a failure, but there has been a lack of forward planning and no real effort towards sustainability. The maintenance of signs seems to be beyond the council, never mind the replacement of the destroyed one. Late 1990s and 2000s housing developments have encroached and broken the trail, thus losing the spirit of 1970s and 1980s decisions to embed the heritage sites within architectural plans. The trail has no publicity and the booklet can no longer be purchased from local shops or tourist information centres. These are all issues that could be dealt with – and perhaps key to this is to engage local people in the urban prehistoric resource. The adopt-a-monument project at the reconstructed Raigmore ‘stone circle’ in Inverness is a perfect example of this, where community engagement in a monument that was moved and rebuilt in the 1970s has revitalised the monument and fostered a sense of community pride. Heritage trails in urban places have no realistically sustainable future without local public engagement and support and so people need to feel they have a stake, that they have a sense of ownership. This is a key element of the second trail I want to look at. 3300 houses. A 184 hectare site. A massive new urban development in Oxfordshire. Place-making, money-making. Community-building, building a brand. 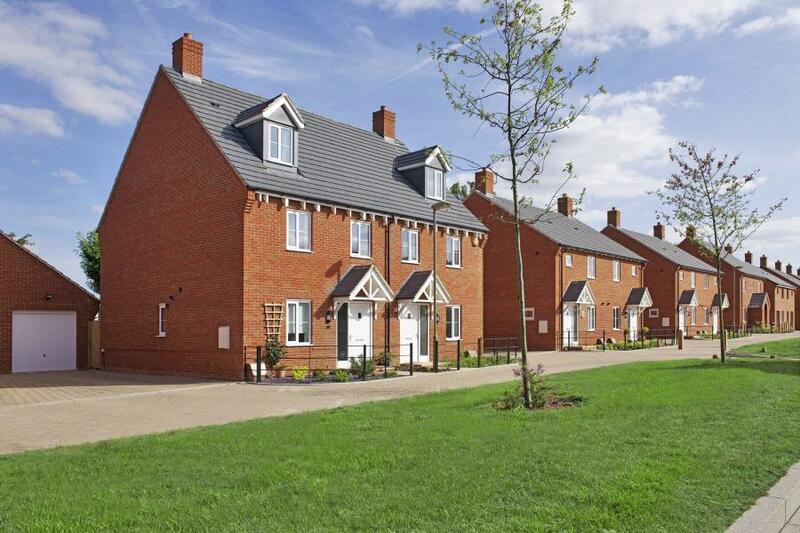 ‘Great Western Park is more than a new housing development – it’s a new way of life’. Archaeological evaluations and excavations in advance of the construction of Great Western Park revealed extensive and long-lived traces of human activity in this area, from the Mesolithic onwards. Archaeological work started in the area in 2001 and the results of the excavations are chronologically arranged in the website of the house builders, which I suppose makes them feel good about themselves. Notable prehistoric discoveries include a large hollow with a scatter of diagnostically Mesolithic blade tools and cores, many of which were burnt flint, while a nice Neolithic bowl was found inverted in a tree throw. Much of the work was done by Oxford Archaeology. Plans were developed by local people to create an archaeological walking trail within the new development. Karen Waggott was one of the main drivers behind this proposal, including getting 1200 signatures on a supportive petition. 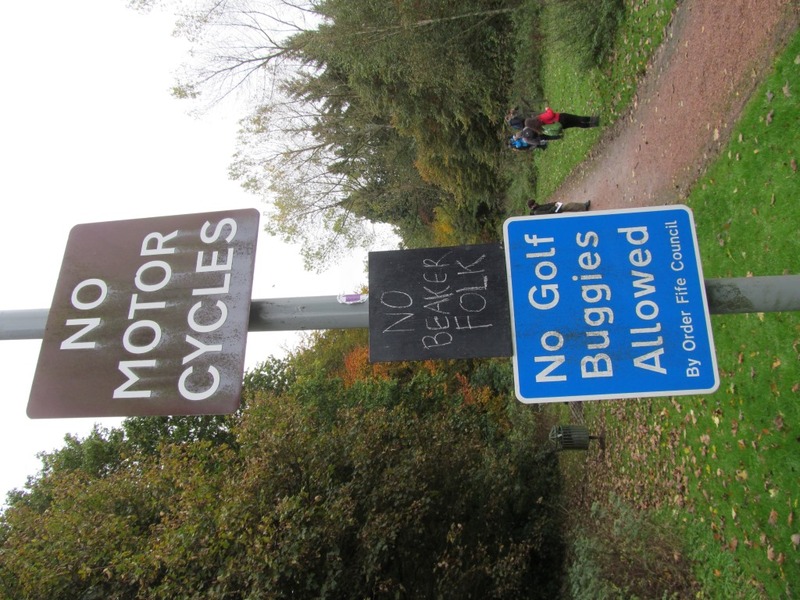 A campaign was organised by locals under the banner the Didcot Dogmile group and a proposal laid out. The group called themselves this due to an existing dog walking trail. The proposed history walk was pitched as a ’9000 years of history’ trail. As well as information boards, the walk would also include green spaces and a reconstructed BA roundhouse. This was very much a community lead initiative: ‘Up until local people found out about the archaeology, developers planned to build over most of it, having first removed the finds.’ (save our sites). And the campaign was explicitly about preserving the memory, significance and identity of this place – the residents’ proposal is aimed at ‘Saving our heritage for our children’. 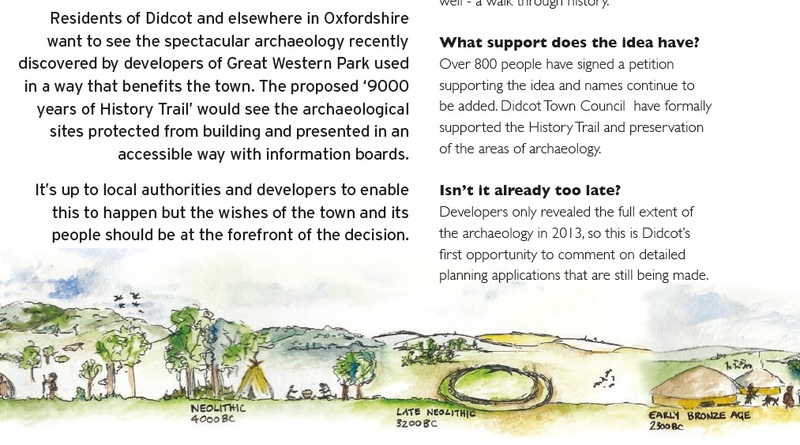 The message here is that archaeological ideals like ‘preservation by record’ and ‘a phased approach to archaeological works, reducing programme and cost risk to the client’ (Oxford Arch) hold little water with local people. But in the end the developer’s decided against adopting the archaeological trail, and instead offered to put up five rather passive noticeboards and protect the location of – how boring – a Roman villa. 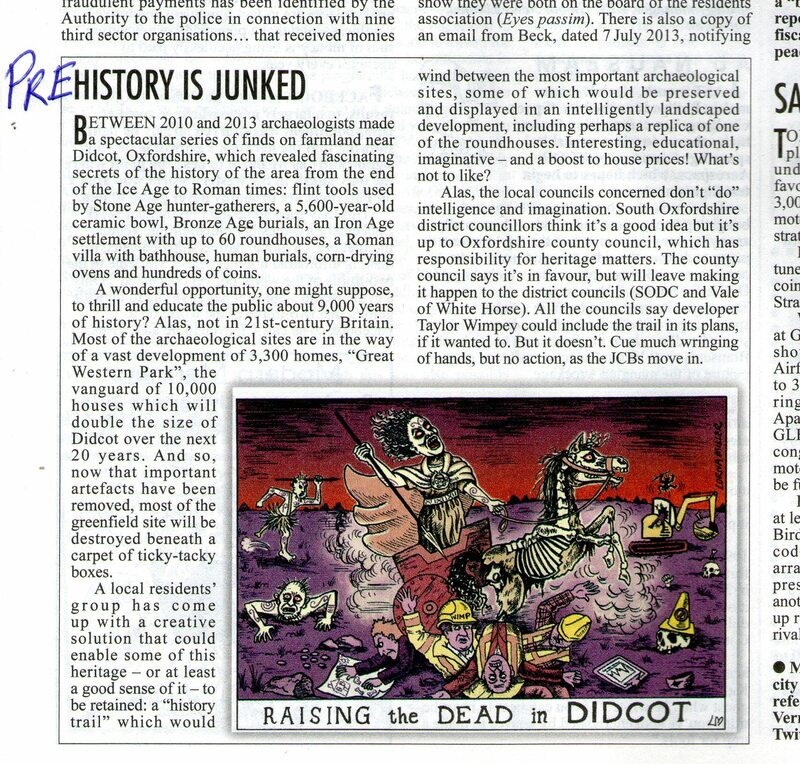 Karen Waggott noted (as she received an award for her campaigning) “I wanted a trail linking up the sites of the key archaeological finds but the developers didn’t agree to this.” The Private Eye’s Rotten Boroughs (14th November 2014) take on this situation was less charitable – “now that important artefacts have been removed, most of the greenfield site will be destroyed beneath a carpet of ticky-tacky boxes”. Various levels of local government passed the buck between them and left the decision to the developer, Taylor Wimpey, who vetoed the plans. Private Eye noted: “Cue much wringing of hands, but no action, and the JCBs move in”. Construction of the estate has been ongoing since 2011 although campaigning for the history trail continues to this day. Yet the Developer’s are happy to exploit the archaeological and historical heritage of this place for their own social and marketing ends. Rob Phelps, Technical Director for Taylor Wimpey has said: ‘The archaeological work at Great Western Park has revealed some extremely interesting and significant findings that otherwise would have remained unknown. We are eager to safeguard this window to the past – much of the Roman farmstead for instance, will be preserved under sports pitches [what!?]. Our intention is for the development to provide homes for generations to come in Didcot, just as the site has done for thousands of years’. (Oxford Archaeology project webpage). But yet in reality little has been done to enshrine and embed these discoveries in this newly created suburbia. Wouldn’t it be nice if each new home owner was informed of what was found beneath their property? What was removed / destroyed to allow their home or garden or garage or driveway to be built? What about a nice photo of key objects found or a certificate of ancient authenticity? If housing developments like this must happen (and for various reasons, it appears they must) then at least let them be teaching and learning opportunities. Let one outcome be that people become more informed about the past, the prehistoric past, beneath their feet or large TVs. Make sure that the deeds to the house include the price that was paid. Allow for those who made these places initially, 1000 or 5000 or 8000 years ago to be acknowledged. This isn’t too much to ask, and for those new homeowners who are not interested in such things, they need pay no heed. But I am sure many would be. And such unique traits could be viewed as adding value to these houses which, with the best will in the world, have few other unique architectural qualities. One really nice way to do that, as is the case at Balfarg, is using street names, which is actually a powerful way of reminding and foregrounding the past significance of places. Street naming themes have emerged for the new estate, one of which has a curious prehistoric resonance. It was decided in 2011 to name eight streets after soldiers from the Explosive Ordnance Disposal Regiment, Royal Logistics Corps based at Vauxhall Barracks who died in Afghanistan and Iraq plus one soldier who lost both legs in Iraq (Oxfordshire Guardian). This is testament to the power of street names which are not, it would seen, always named after random Scottish Glens or species of bird. 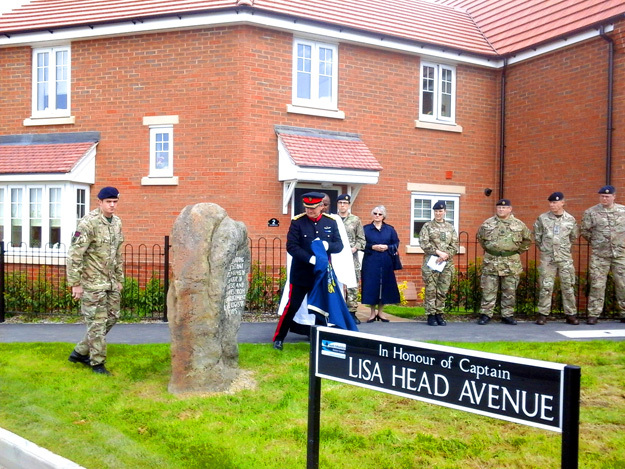 And as part of this memorialisation, a standing stone has been erected (a ‘memorial stone’). What can be learnt from these two experiences, one of which is emergent, the other perhaps in decline? At Balfarg, high expectations which began with the ‘saving’ of the archaeology and the draping of the urban around the prehistoric, and culminated in the creation of a trail and the writing of an excellent booklet, gave way to apathy, lack of resource and the commercial realities of development. At Didcot, a fantastic opportunity was created by massive urban development, which in turn tapped into community enthusiasm, time and resources, but this vision in the end fell short due to commercial cynicism and a sense that enough money had already been spent on digging the stuff up. Karen Waggott told the BBC: “We’re losing our history just as we’re finding out about it.” This is just plain sad. Heritage trails and the appropriate and meaningful display of urban prehistory requires so many things to go right that if often does not – community, local government, business, visitors and archaeologists need to work together and for the common good in order for interesting and sustainable trails to be created and maintained. These need to be about tomorrow, not just today, and certainly not all about yesterday. Heritage walking trails have the potential to be, literally, pathways to impact. Sources and acknowledgements: elements of this blog post were first aired at TAG in Durham a fair few years ago, mostly Balfarg musings. The Balfarg photos are all mine. 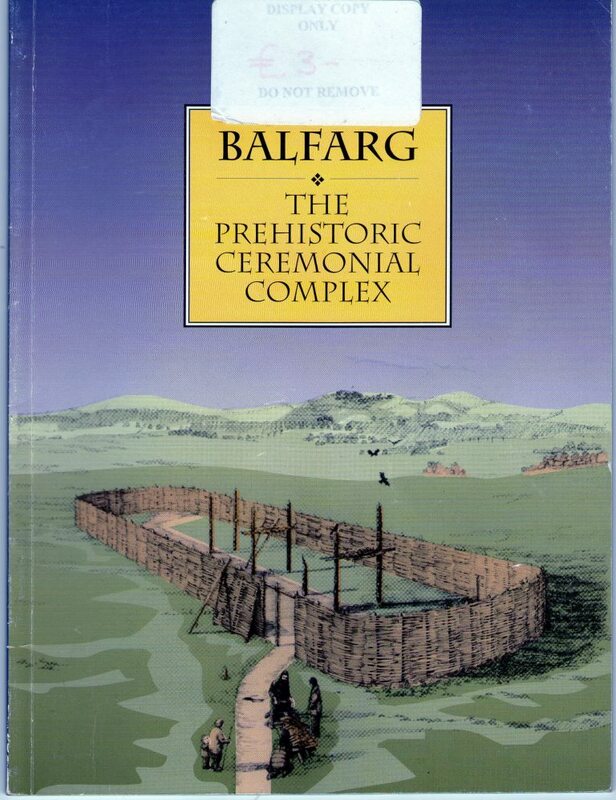 Thanks to Gordon Barclay for a recent interesting discussion about his excavations at BRS in the 1980s, and in the past I have chatted to both Roger Mercer and the late Graham Ritchie about their Balfarg experiences. 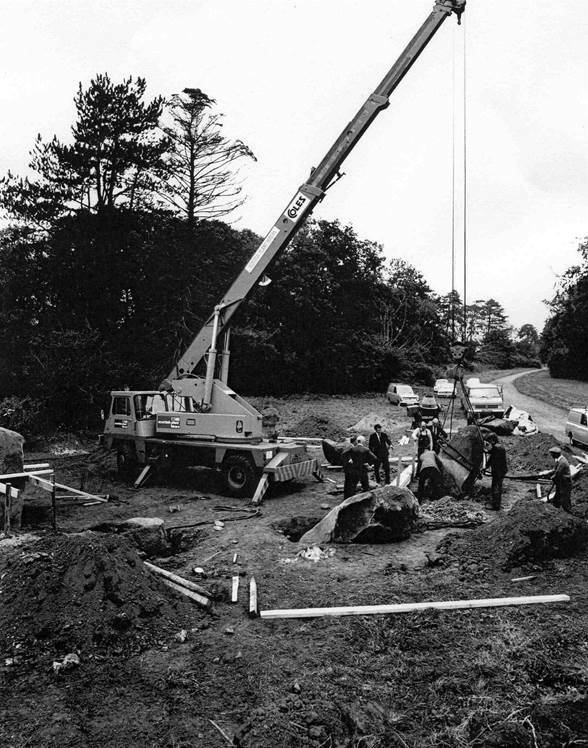 The photograph of Balbirnie being dismantled is a RCAHMS image, and so crown copyright. The Didcot aspect of this blog has by contrast been derived from online research, prompted by the article in the 14th November 2014 edition of Private Eye; I have included a scanned and slightly amended extract from this in my post. Information on the Dogmile residents’ plan came from several newspaper interviews, mostly from the local Herald newspaper, and these have been linked to above. 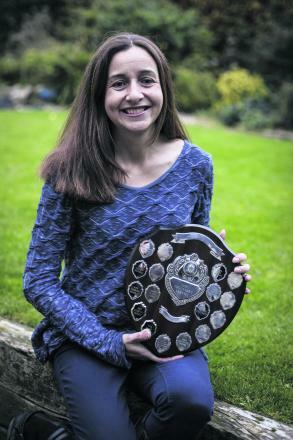 This was the source of several Didcot resident quotations and the photo of Karen Waggott getting her well-deserved award; the memorial street name photo came from the Oxfordshire Guardian. The detail of the proposal for the walking tour came from the excellent Didcot Dogmile website; link in post. 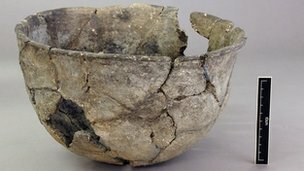 The photo of the Neolithic bowl came from a BBC news story about the development which was the source of the final Waggott quotation. Finally, information about the excavation results and the Estate, including the house images, came from websites associated with the developer and Oxford Archaeology (links in post).